What can I do for Free in Omaha, Nebraska? Malcolm X was born in Omaha, Nebraska. Omaha offers a variety of interesting activities that are free. Whether you're outdoors or indoors, you'll never run out of great things to see and do that are free in Omaha. Girls and Boys Town, Mormon Pioneer Cemetery, Old Market and the birth sites of Gerald Ford and Malcolm X are just some of Omaha's free attractions. Girl's and Boy's Town is a working facility that cares for and helps abandoned, abused and neglected children and is a "must see" attraction that is free in Omaha. It began in 1917 as Father Flanagan's Boys' Home. The movie Boys Town starring Spencer Tracy as Father Flanagan was released in 1938 and mementos from the movie are available for viewing at the Girl's and Boy's Town. The Town works with community organizations and schools and has a campus, gardens and a Hall of History. Mormon Pioneer Cemetery has over 600 Mormons buried in it. These Mormons died traveling the Mormon Pioneer Trail in the cold and rough weather conditions in the winter of 1846. Over 70,000 Mormons used this route between 1846 and 1869, which stretched from Nauvoo, Illinois to Salt Lake City, Utah. The Cemetery contains monuments and landmarks honoring the Mormon pioneers and can be viewed for free in Omaha. Old Market is a 12 block shopping district in downtown Omaha with brick streets and historic buildings. It is recognized as a historic district by the National Registry of Historic Places and the Chamber of Commerce is known to organize walking tours. Visiting Old Market is free in Omaha unless you want to buy something in the many shops. Browsing is free, however, and, at least at the time of this writing, the Old Market stores include two second hand stores: a bookstore called Jackson Street Books and a clothing store called Retro Recycle. Gerald Ford Birth Site and Rose Gardens honors and remembers the 38th American President who was born in Omaha 14 July 1913. The rose gardens were added in honor of Ford's widow, Betty. The birth site features a replica of Ford's childhood home, since the original was destroyed by two fires. The replica home contains memorabilia from Ford's days in the White House and you can see both the home and the gardens for free in Omaha. Malcolm X’s Birth Site honors and remembers the African-American activist who was born in Omaha 19 May 1925. There is only an information marker to see here as Malcolm X's childhood home is no longer on the site, but the site has important historic significance. 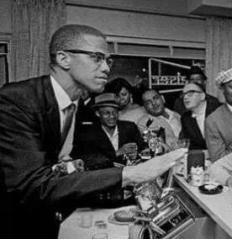 Malcolm X’s birth site is recognized by the National Register of Historic Places. Is Stonewall Jackson Really Buried in Two Places? What is an Omaha Indian? What is the Omaha Tribe? What are Some Tourist Attractions in Omaha, Nebraska?